9 1/2" x 1 5/8"
9 1/2" x 1 3/4"
For your diner, restaurant, cafe, or catered event, bake your favorite pies in this Anchor Hocking Oneida 82638AHG18 9" x 1 1/2" glass pie dish. 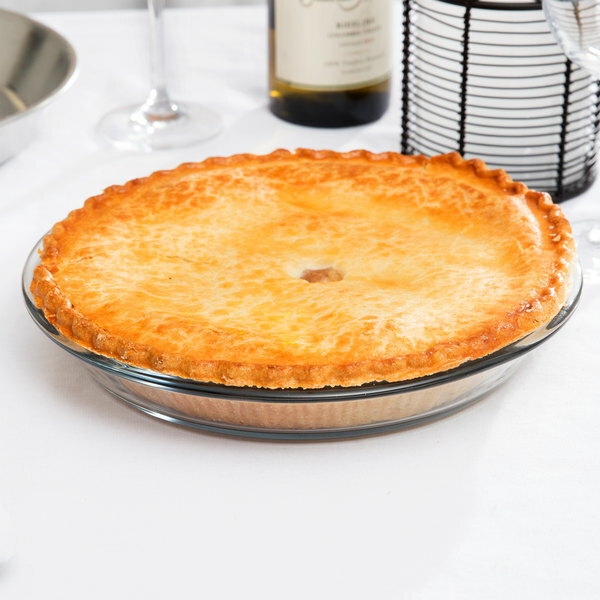 This pie dish can withstand extreme temperature changes without breaking or shattering. It can go directly from your refrigerator or freezer into the oven. This pie dish's simple, slightly tapered design is perfect for baking apple, strawberry, blueberry, or peach pies. Its elegant design will look great on any table. It is made of 100% soda lime glass to provide excellent clarity of your products. The Anchor Hocking 82638AHG17 9" x 1 1/2" Pie Plate is a great quality glass pie plate from a consistent and reputable manufacturer at a bargain of a price on WebstaurantStore. The Bottom Interior Diameter (ID) is 7-5/8 inch with the stated 9" Top ID. The Depth is a little off, not the stated 1.5 inches but more like 1.25-1.375 inches. The lip is about 3/8 inch around. This gives it internal volume capacity of about ~4-4.5 cups as measured by filling to the brim with water on a digital scale. Etched into the glass it states a capacity of 0.75 QTs or 3 cups but obviously this is conservative. So all in all an excellent glass pie plate with about a ~4 cup capacity comparable to the traditional, non-deep dish, original Pyrex pie plates. Good quality and construction. Great price for holiday baking when you need an abundance of pie pans at one time but don't want to use foil pans. Great dish for making pies or cheesecakes also great for small casseroles. It’s kind of shallows which I don’t like but it’s still nice to have in the kitchen. 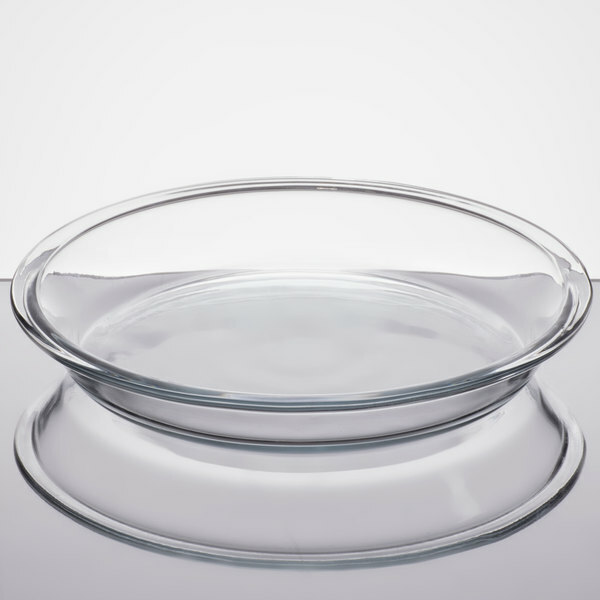 Anchor Hocking is always a good quality product and this basic glass pie plate is no exception. I received them in excellent condition and they have performed well. You can't go wrong with this traditional glass pie plate (or its price!). It's the exact same dimensions as my brand name pie plate and they stack perfectly together...almost can't tell them apart, except that they have different markings on the bottom. My only complaints are that the rim isn't quite as wide as I wish it would be (for easier holding and more real estate for attractive crust crimping) and the edge on the inside of the rim has a sharp-ish little upturn to it. Doesn't matter at all when it has pie in it, but if you're carrying the empty pie plate it's not completely smooth. Very minor complaints though, this is a good pie plate to have on hand. Glass pie plates are the best! They don't tarnish or dent like aluminum pie pans do - they also have the added benefit of being able to see if the bottom of your food is getting browned or bordering on burnt! Not only is the Anchor Hocking glass pie plate for baking pies, it's a great item to have for baking or microwaving small amounts of food. Its easy to wash and doesn't take up much space in our dishwasher. These pie plates are awesome. they are durable, and incredibly cheap. I like that they are not made with any weird chemicals so it's safe! These are great pie plates. I've used them for everything from pie, to stuffed shells, to making pull apart cinnamon bread. They are very affordable and will last a long time. This is a nice pie plate. Anchor hocking seems to always exceeds my expectations with their glass wear because of how clear and durable it is. Very simple yet elegant looking, it's so classic, it's not dull yet it is traditional, and seems sturdy for being glass, plus a great buy, give it a try! I really like this product but I really did find myself missing the handles that some of the other models have. Super easy cleanup however makes this product a go to! This pie plate is perfect for just about any pie you can think of. it comes at a great price and i love using it. Standard simple tempered glass pie dish. It actually is not that much shallower than the "deep dish" pie dish from the same company. It works really well though and looks nicer than the cheap aluminum ones. I wasn't sure which pie plate to get and I do like the Anchor Hocking brand so I included all three available in my order. I'm glad I did. Each one is slightly different and will be used. They are sturdy but pretty and arrived without a mark. I bought this pie plate thinking I would barely use it, but I have found several recipes that say to put it in a pie plate (non-pie recipes) I love things in the kitchen with multiple uses. It will be great for pies too! Great pan. This is a classic, dependable, must have for any kitchen. It is great to be able to see the bottom of your crust to check for doneness while baking. These pans last a long time and glass is easy to clean and bakes evenly, which are two huge pluses for me! Anchor Hocking isn't anything fancy but it gets the job done. Pies look good in this simple pie plate and I prefer the smooth edges to any of the more frilly styles. This simple pie dish is great for those shallow pies and looks elegant, despite lacking any bevels or extra designs. Cleans off easily and stacks for storage. I use these pans for my display pies in my bakery. They are very beautiful and well constructed. They help make my pies look amazing. these glass pie pans are great. The glass is very durable and bakes evenly. It is nice to be able to see the browning while it is still baking on the underside of the pies. Very pleased! These pie dishes are quite heavy-duty and at a very attractive price. They are just the right depth and right diameter for nearly any pie and are much more substantial than the usual tins. The best thing about glass pie plates, is they do not darken the crust on your pies. and they serve as great oven to table ware. 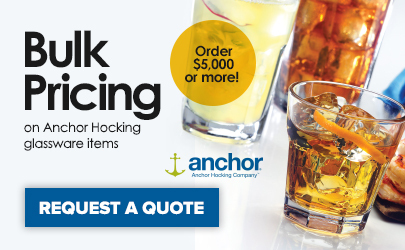 The price is unbeatable, and the quality is what we all trust from Anchor Hocking. The pies are a little on the small side, great for sweet potato or baked fruits, or quiche, on a lazy Monday dinner. I suggest picking up 5 of these for family dinners and they also are a GREAT serving dishes for Sunday breakfast. these pie pans are perfect for serving our salads in our shop! the dressing does not run all over the place! and so affordable also! thanks! i have been looking for a glass pie plate for a while that is reasonable in price. this made a difference in making my special coconut pie.